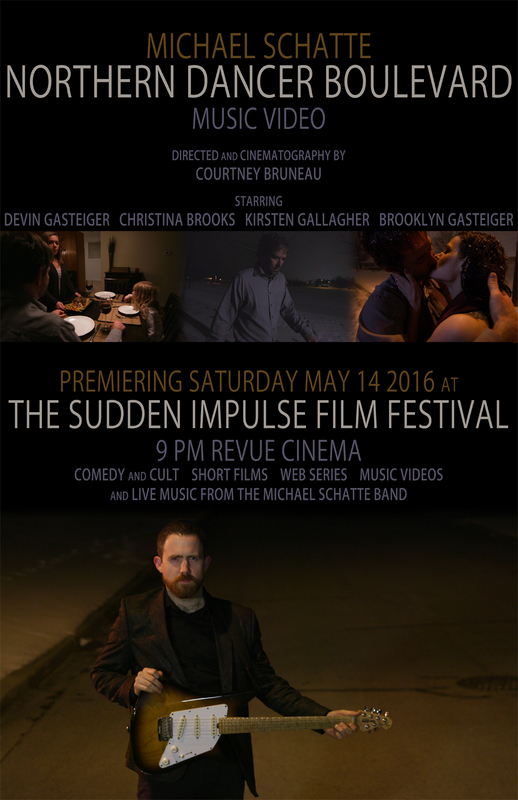 A music video for Michael’s song Northern Dancer Boulevard (track 2 on the Turn Back the Vikings album) will premier Saturday May, 14th at the 5th Annual Sudden Impulse Film Festival. Directed by Courtney Bruneau of CABruneau Productions, the new work is the most ambitious Schatte music video yet produced. To help launch it, The Michael Schatte Band will perform at the event, tickets for which can be purchased for $15 here. The Sudden Impulse Film Festival showcases local comedic and cult short films, music videos, web series and parody commercials. Hosted by Stefan Kuchar the night starts at 9pm and features three 45 minute slots of films with two intermissions and a follow up performance featuring The Michael Schatte Band. Mature content.